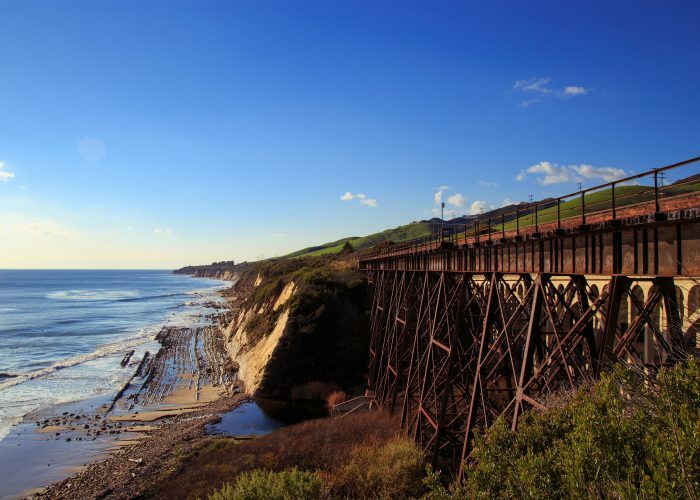 Travelers come from around the world to experience this gorgeous West Coast train journey. Amtrak’s most popular long-distance route and widely regarded as the most stunning, Coast Starlight welcomed more than 455,000 passengers last year. The Coast Starlight whisks you past waterfalls, lush forests, snowy Cascade Mountains, and the Puget Sound. To see long stretches of Pacific shoreline—views you won’t get from the highway—book a seat on the west side of the train. If you upgrade from coach to a small private room with beds you’ll have upgraded dining and access to the Pacific Parlour Car with its dome windows and evening wine and cheese parties. Want to extend your trip to San Diego? Connect to the popular Pacific Surfliner train at L.A.’s Union Station. Tracing portions of the Lewis & Clark Trail from America’s heartland to the Pacific Northwest, the Empire Builder is a great way to see the United States. You’ll cross the Mississippi River, venture into Montana’s Big Sky country, and pass Glacier National Park. From Spokane, you can either head south along the Columbia River Gorge to Portland or cut through the Cascade Mountains north to Seattle’s Puget Sound. Along the way, mountain passes are marked with lofty trestles and long tunnels, while rivers feature hydroelectric dams and salmon fish ladders. During spring and summer, an onboard volunteer National Park Service ranger shares facts about the landscape. There are plenty of 20-minute stops where you can get out and stretch your legs—or pick up a pizza delivery. 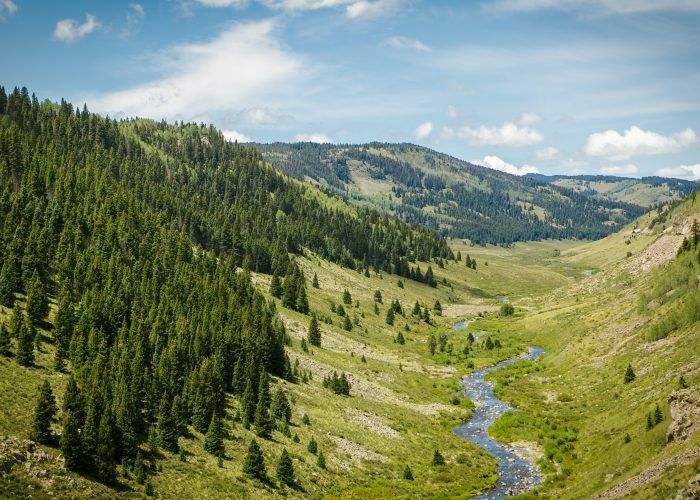 Looking out the windows of the California Zephyr, you’ll see the same sights that enchanted 19th-century fortune seekers as they rode the first transcontinental railroad line west to San Francisco and dreamed of striking it rich. 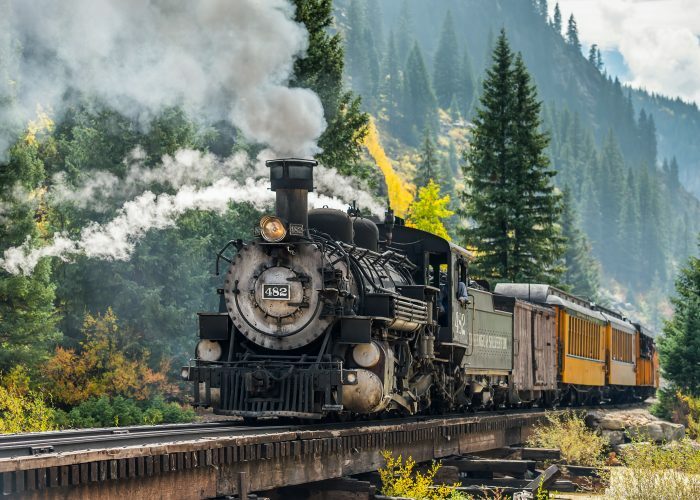 This historic line takes you through the heart of Gold Rush country’s mining and ghost towns to old stagecoach stations that became stops on the original railroad. Rocky Mountain tunnels carry you across the Continental Divide, while aspens and evergreens dot the steep cliffs of Glenwood Canyon on the Colorado River. 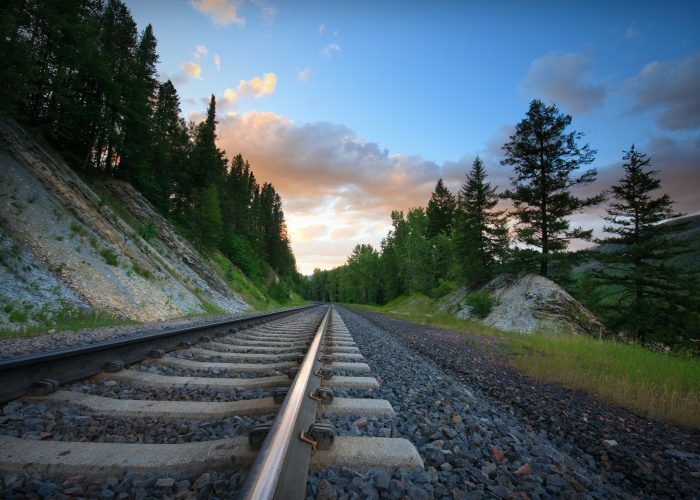 “I especially enjoyed the scenery,” says James S., a Vacations By Rail Passenger. “The highlight was an American eagle flying over the Colorado River right next to the train.” The journey ends with one last bucket list sight: the Golden Gate Bridge. On these rails once ran the nation’s first all-Pullman sleeping car train, dubbed the “Train of the Stars” for the celebrity passengers that frequented it in the late 1930s. Today, the Southwest Chief follows that same route between Los Angeles and Chicago. 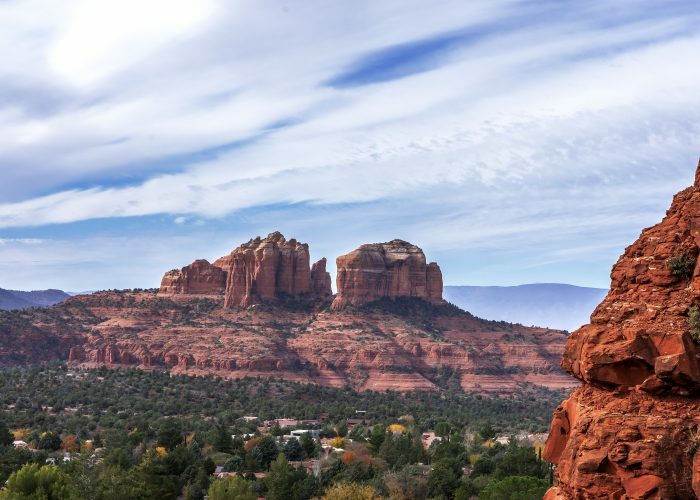 Book a sleeping car and enjoy the thrilling curves and switchbacks that lead to some of America’s most iconic sights: the Santa Fe Trail, Sedona’s red cliffs, pueblos and missions, the Grand Canyon, and the Continental Divide in the Rocky Mountains. Tucked among the grandeur of the American West you’ll find beauty in modest, everyday living, too. Watch farmers harvesting expansive wheat fields and dogs playing in back yards. From the window of a train it’s fascinating to see how different people live in different parts of the country. Arriving at Grand Canyon National Park on this rail line, as visitors did in 1901 when the railway opened, helps you imagine what a remote, inaccessible wonder the canyon once was. You can still ride in the Grand Canyon Railway’s historical cars pulled along by the “French Fry Express,” a converted 1923 locomotive that now runs on recycled waste vegetable oil from South Rim restaurants. 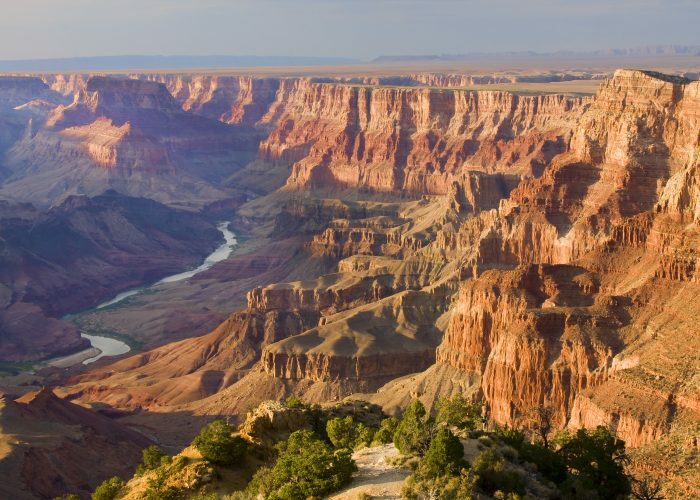 En route to the canyon are pine forests and sprawling prairies with plenty of chances to spot antelope, the California condor, and wild horses. Onboard, colorful railway characters keep history alive with mock train robberies and cowboy musicians who lead passengers in old-time sing-alongs. Once at the log-cabin style Grand Canyon Depot in the South Rim, you’re within walking distance of popular viewpoints and most of the village’s historical buildings. Set nearly two feet closer together than standard rail lines, this historic narrow-gauge railroad was built during the silver mining boom specifically so it could hang onto sharper curves and clear tighter spaces on mountainsides. No doubt, the Durango & Silverton Narrow Gauge Railroad is a thrill to ride along the Animas River. The canyon’s rock walls are only inches away in some sections, so tight you’re inclined to draw in a breath and make yourself smaller. Along other stretches you can’t even see the canyon’s edge, only the immense chasm below. Elk occasionally meander near the tracks and bighorn sheep inhabit the cliffsides. From May through October you’ll hear stories about the coal-fired, steam-powered engine and the mining legacy of Silverton onboard this rolling National Historic Landmark. The longest (64 miles) and highest (10,015 feet) steam railroad in America, Cumbres & Toltec originally served southwest Colorado’s silver mining district. Today this scenic railway totes only passengers as it chugs up a 4 percent grade in the San Juan Mountains and edges narrow gorge ledges with views 800 feet straight down. “It’s a ‘Williamsburg on wheels,’ an authentic National Historic Landmark that moves,” says Lee Bates, Cumbres & Toltec’s marketing and communications manager. Passengers can experience history from a parlor car, coach car, or the open-air gondolas, which are especially popular in the fall when the aspens shimmer their golden glow. The train runs Memorial Day through October. Fun trivia: The train has appeared in more than 20 Hollywood movies including Butch Cassidy & the Sundance Kid. From mid-May to mid-September, Alaska’s days are long, plants are blooming, wildlife is on the move, and the Coastal Classic offers daily departures so you can experience it all. The route, from Anchorage to Seward, follows the shoreline of the Turnagain Arm, where 3,000-foot mountains plunge straight into the ocean. Watch for beluga whales in the inlet and, farther along on the journey, Dall sheep on cliffsides and bear and moose in the backcountry wilderness. The conductor slows the train for wildlife and glacier photo ops. 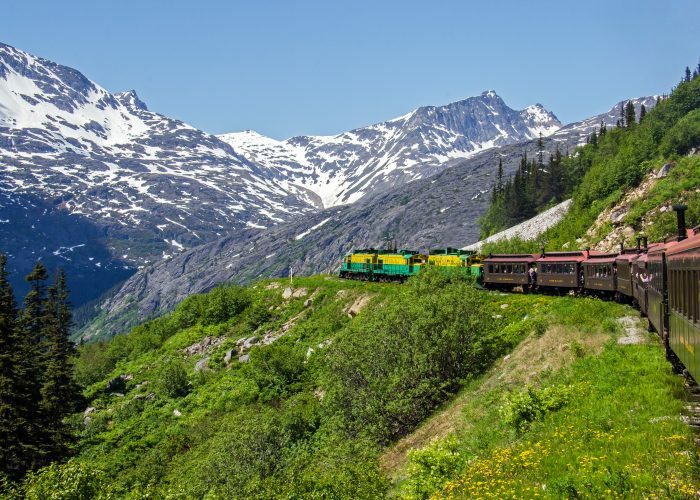 Once you reach Seward, there’s a seven-hour stopover with plenty of touring options—including boat cruises, national park tours, glacier treks, and sled dog rides—before you return by rail to Anchorage in the evening. 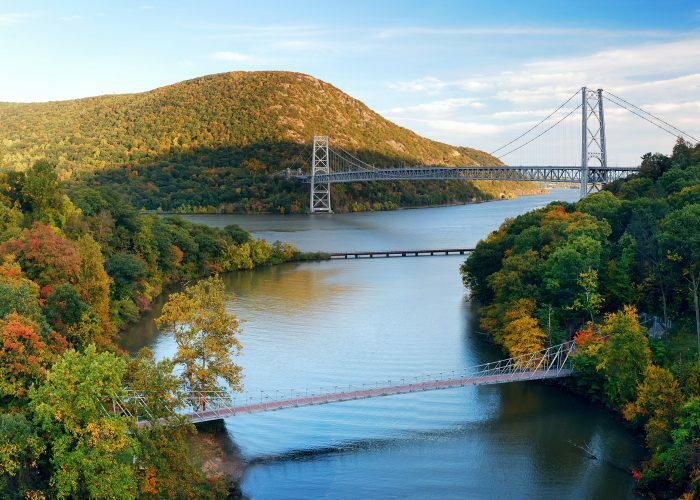 Leave New York City in the morning and Amtrak’s Adirondack will take you through charming towns and along the beautiful Hudson River Valley, delivering you to Montreal by dinnertime. If you travel in autumn, you’ll look out over deep woods and vineyards bathed in color. Between New York City and Albany, meticulously kept mansions line the banks of the wide blue Hudson River. 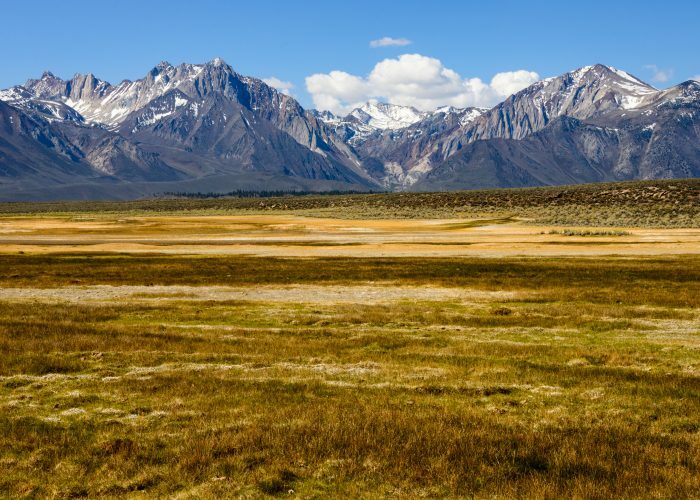 It’s easy to see how the natural splendor of this valley inspired an entire artistic genre. 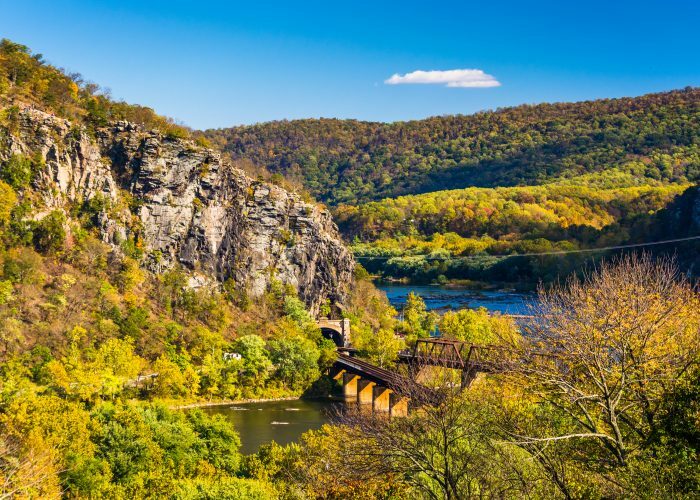 Other don’t-miss sights along the route include the Adirondack Mountains, the Palisades, West Point Academy’s riverfront stone battlements, and the Bannerman’s Castle ruins. In the mountains of West Virginia, steam-driven Shay locomotives still run on the same line once used to haul lumber to the mill in Cass in 1901. The old logging flat cars have since been refurbished to carry passengers from May through October. Pistons pulse, black smoke puffs, and the whistle sounds as the train chuffs out of the station. First stop: the recreated 1940s logging camp at Whittaker Station, where there’s time to wander and grab a snack. On the full four-and-a-half-hour round-trip to Bald Knob, you’ll continue on for the climb up to the state’s third-highest point, stopping off at a spring so the train can take on more water to produce its steam power. This extra stretch includes lunch and spectacular views at 4,700 feet.